They come in all shapes, sizes and colours. But why wear ear plugs at concerts? What ear plugs are the best? How do they work? So....many....questions. But fear not, we have the ultimate guide to hearing protection and we've broken it down in simple terms. 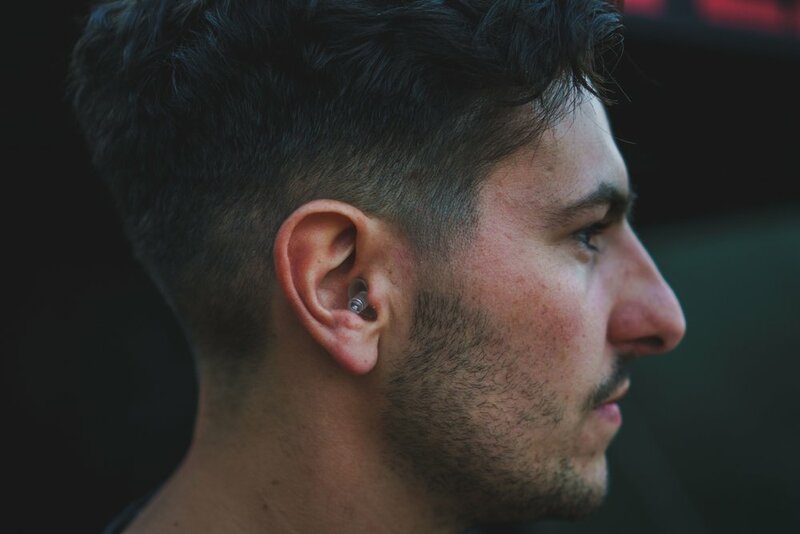 From why wear them in the first place, their functionality to our top picks, welcome to your one-stop shop for protecting your hearing at music events. How Do Ear Plugs Work? The purpose of any ear plug, be they foam, high fidelity or custom made, is to prevent this damage. High fidelity earplugs take into the account the resonant frequency of the ear so that attenuation of the sound is even across the frequency spectrum, preserving the original musical quality, only quieter. Whereas foam ear plugs act as a cork in your ear, blocking sound from entering it almost completely. The extent to which they do this is measured by their Noise Reduction Rating (NRR); the measure of how much volume is decreased by the ear plug and is counted in decibels (dB). The higher the NRR, the longer you are able to stay a loud environment as it stops the full sound energy from entering the inner ear. Aside from improved NRR, the payoff enjoyed by those who invest more money in ear plugs is improved comfort and sound quality. For more specifics read this. Despite the relatively well-known fact that concerts and club nights come with physical dangers that can be decreased through ear plug use, their use is still confusingly uncommon. You can imagine that the majority of those who don't use them are not simply ignorant of the risks this incur, but simply underestimate them; isn't it worth risking a little discomfort later in life to make these current experiences a little more special? This common thought is hampered by lack of understanding of both the risk and the experience. As for the risk, it's important to be aware that 26 million Americans suffer from hearing loss that could have been avoided. It's possible to incur hearing damage during a single event; in fact it can take a mere 2 minutes for 110-decibel sound (twice as loud as a normal conversation) to incur hearing damage, which can manifest itself as hearing loss or tinnitus (a condition wherein the sufferer hears a constant high pitched noise). These issues can lead to everything from depression to high blood pressure; there have been multiple documented cases of tinnitus leading to suicide. If you're more concerned about losing ear plugs than about their quality (perhaps you want to use them for sleeping in snore-laden hostels), you can buy large packets of single-use foam ear plugs on amazon, such as this pack of 60 ear plug pairs from Mpow. This is the same type of ear plug that is given away for free in a lot of good clubs! If, however, you actually want to hear the music without experiencing ringing after, we recommend getting a pair of these babies. High fidelity ear plugs protect your ears from damage whilst maintaining sonic quality, decreasing the volume rather than muffling the sound as generic foam ear plugs do. These allow you to dance in safety without missing out on the sonic details that make modern dance music spectacular. There are a variety of options available online and in stores, all of which are reusable unlike foam ones. We stock Alpine Hearing Protection and this is for a number of reasons; comfort, design and sound quality. When deciding which ear plugs to recommend we tried LOTS. We wanted to make sure the products we were recommending are the ones we would wear (which we do). Alpine came in top for the reasons listed above. Alpine’s PartyPlug is one of the cheapest options there at £10.99, without compromising the sound quality. They also come with, in our opinion, the best keyring pouch out of all the high-fidelity ear plugs (some are seriously annoying to use). Then there’s the more expensive PartyPlug Pro at £24.95. Designed for musicians and the true music lover, it offers increased protection as well as a clearer sound. It also comes with cleaning spray and a handy neck cord. Other popular options include ear plugs from Senner and Ear Piece. Senner, Amazon UK's bestseller, are an ideal option if you have your specifics in mind beforehand; you can buy their ear plugs according to size and NRR, with options including the 20db MusicPro ear plugs (which come in small and medium) and the heftier 28db Strong Pro option. Ear Peace (Amazon UK's top recommendation), like the PartyPlug, are a better choice for first time buyers, as their ear plugs each come in a single (very well-reviewed) size. This is one variety of ear plug you're unlikely to buy into if you're new to the concept but may want to invest in if you're spending a large amount of time in loud surroundings. Their form is typically based on impressions taken from your ear canals, thus allowing it to perfectly fit your individual shape and size. They are both more expensive and more comfortable, whilst additionally being better attuned for noise cancellation (many include interchangeable filters that vary the noise-reduction), and as such are increasingly the option of choice for professional DJs. They typically start at £130 and, if you really want to push the boat out, in-ear monitors can cost in the thousands of £. You can’t put a price on hearing…. A relatively new, comparatively cheap option that slightly riffs on the Custom Ear Plug is the self-made custom ear plug. Ear plug making kits such as this one from R&G can be purchased from American vendors on Amazon, though they are typically marketed towards proponents of sports such as biking and shooting. Though very reasonably priced, the - generally very positive - review section reveals that many users found it difficult to make a finished product without the additional use of other DIY products such as a mini-saw, which likely explains why they haven't been taken up by time-pressed dance music fans. Although it may simply be a matter of limited information! One particularly charming review states that this cheap option is 'full of win'. You're a lot more likely to cause harm to yourself when clubbing without ear plugs than going out with, but it should be noted that they aren't without risk; it's entirely possible for dancers to drunkenly push them too far into their ears, causing discomfort or - if you really shove them in - harm. However online forums imply that this happens very rarely, and the soft textures incorporated typical ear plugs design further minimise this risk. Aside from club-related issues, it should be noted that the use of ear plugs during sleep can also incur risks. Wearing them too frequently can cause ear wax to build up at the back of your ear, which then require the use of ear drops or medical assistance to be removed. If untreated, these build-ups can lead to ear infections, as can consistent use of ear plugs without cleaning them; both of these are risks due to their capacity to facilitate the growth of bacteria. However, most internet sources agree that, provided you regularly clean your ear plugs (or replace them, if you're using foam ear plugs) and don't push them too far into your ear, the potential risks of using ear plugs to aid sleep are negligible. Cleaning high fidelity ear plugs is a simple process; different brands tend to recommend slightly different techniques in the instructions that come with the package, but generally it's a simple case of rinsing them under running water. We recommend buying a new pair every 3 months to ensure you're not at risk of ear infections.